The West Bengal government is amending its Agricultural Produce Marketing (Regulation) Act of 1972, to allow for private partnerships in farming, in a reversal of its recent stance, even as the state has been racked by protests over the entry of organized retailers, who are pushing for such partnerships. The state, ruled by the Left Front government, has been among the few that has not amended the rules governing the distribution and cultivation of fresh produce. Under existing laws, there is no provision for private business firms to get into a partnership with local farmers to produce fruits and vegetables. The draft amendments are currently before the committee of secretaries, after which they will be presented for clearance by the state cabinet. The draft has been prepared by the state’s agri-marketing department. “We do not expect any reversal at this point," says a bureaucrat involved in the drafting of the amendments who did not wish to be identified to avoid controversy. This is a big turn of events in the state’s agri-retail scene, which has been the preserve of the agri-marketing department, the agency that oversees the running of the wholesale markets. Organized retailers in India, who have only just started entering that market, have been arguing for procuring their produce directly from farmers instead of wholesalers or state-run bodies. Some have expressed an interest to enter into direct agreements with farmers so they can ask them to produce what retail stores need. Several wholesalers and state bodies have opposed the move saying it will give large firms too much control over agriculture in the states and threaten the livelihood of existing middlemen. The few corporate players who have entered the West Bengal market, such as Spencer’s Retail of RPG Enterprises and Food Bazaar of the Future Group, have been currently sourcing their fruits and vegetables from the existing wholesale markets. “The opponents to private players in agri-retail have understood that there is really no legal option to block the corporate ventures from accessing farm products," says the same bureaucrat. The monopoly of the agri-marketing department cannot be sustained, given that corporate players can buy from the wholesale markets or even buy the products in neighbouring states where the laws are more lax and bring them into West Bengal. Retailers such as Reliance Fresh, the agri-retail chain of Reliance Industries Ltd, and the Indian cash-and-carry arm of Metro AG have been waiting in the wings for direct access to farmers for their produce. According to an executive at Reliance, who did not wish to be identified because he isn’t authorized to speak to the media, the company is all set to roll out about five Fresh outlets in Kolkata within a week. 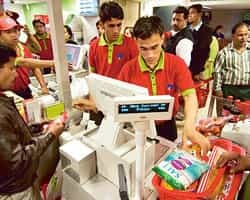 To comfort those still fearing the entry of corporate players, the West Bengal government is launching its own agri-retail chain under the brand Bengal Blooms. The first store is opening in City Centre mall at Salt Lake, the up-market eastern fringe of the city on Saturday. Besides partnership farming, the amendments to the governing Act will facilitate introducing online spot trading in agri commodities and also the setting up of terminal markets in the state. As first reported by Mint, the terminal markets will operate on a ‘hub-and-spoke’ model, sourcing their produce from surrounding areas within 150km radius. They will have collection centres (spokes) where the vegetables and fruits will be washed, graded, sorted and packed, before being sent to the hub with its cold storage, warehousing and ripening facilities. Given the high level of technology required and the capital that will have to be pumped in, the project will require private investment, says Rajesh Srivatsava, managing director, corporate and commercial banking of Rabo India Finance Pvt. Ltd, which did the feasibility study for the project.